Navori Labs QL Professional digital signage engine powers video, animations, graphics and rich data to hundreds of displays at the Bell Centre in Montreal. The most recent expansion was finalized in time for the 2016-2017 NHL season, providing Montreal Canadiens fans and other visitors with a more widespread mix of visually appealing entertainment, information and sponsored content – the latter of which provides Bell Centre with a measureable ROI for its digital signage network. From its initial deployment, the highly scalable QL Professional solution, which Bell Centre self-hosts onsite, has rapidly expanded to hundreds of media players to create a fully digital experience for visitors. The network today supporting content resolutions up to 4K – as well as targeted advertising from sponsors – across concourse displays, concession menu boards, and video walls for experiential signage. The Navori QL solution also supports a massive LCD display at the main venue entrance. Considering these many diverse targets, the flexible QL multi-seat architecture allows many users to create, manage and schedule content both inside the venue and from remote offices with tremendous ease of use. Belzile points to Navori’s flexibility in content creation as a key enabler of this expansion, while noting that Navori QL Professional has zero restrictions on resolutions and aspect ratio. The flexibility of QL Professional, Navori’s flagship enterprise digital signage solution, also gives users the freedom to select an appropriate mix of media players to support targeted playout needs. Content can be synchronized across many screens for important messages, or targeted down to specific displays. The current architecture includes a mix of Windows and Android players, which users can switch between depending on the type of content being disseminated. The flexibility in player options – accentuated through Navori’s “player-agnostic” philosophy – also helps Bell Centre manage its costs appropriately as its digital signage network expands. While the versatility of visual content appeals to sponsors, fans also find the rich data capabilities compelling, and often directly engaging. During many events, Bell Centre employees walk the concourse with iPads to offer 50/50 raffles. The iPads are connected to a common Avaya network that hosts Navori and other IT and AV systems, including Matrox encoders and decoders that extend Navori content distribution over the network. 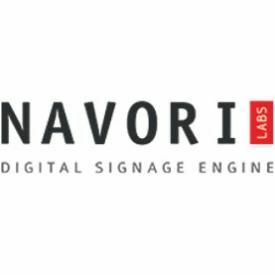 As employees enter new information into the iPads, Navori QL automatically updates the raffle information, including winners, on various displays every 15 seconds. On the audio side, Belzile worked directly with Navori to create a message-on-hold program. The Navori players feed audio related to event, security and other important visitor information to callers; as well as to standalone sound systems at the box office and around the concourse. This flexibility eliminated the need to purchase a separate audio playout system, further extending the value of Bell Centre’s investment in Navori QL Professional software.